Soccer players all are tall, lean, muscular, long legged young males. Athletes can gain from the experience of dealing with diverse people. The input from disadvantaged minority people with different life experience, who dribble differently can be a new enriching experience. A diverse team will have a more diverse, and thus improved soccer game. 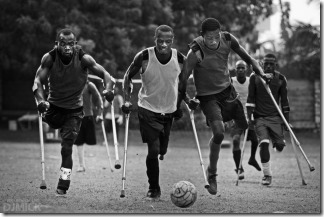 "No soccer player left behind", mainstreamed training would train the world elite players together with normal high school soccer players, women, amputees and midgets. This helps to close the achievement gap and makes sure the top soccer players remain humble and maintain the ability to play soccer with regular people. Small people (dwarfs) are discriminated against. 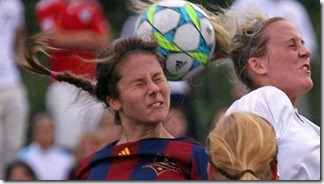 Since elementary school, they are told they aren’t good athletes. As a consequence of this low expectation, they actually end up as low performers and are excluded from sports events. 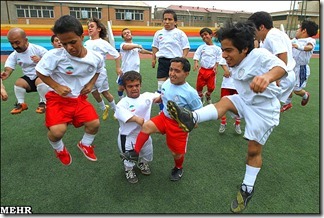 As a result of this unjust exclusion, even the smallest top soccer players in world cups are all over 168 cm. In basketball, this "heightism", discrimination by height, is even more pronounced. Additionally, sport is sexist. Women are born with equal talents as men, but no women participate in the most highly paid leagues. Women soccer players must be paid the same as men, as in tennis. All countries could vastly improve the quality of their national soccer teams if they did not restrict themselves to a small minority but selected from the huge number of excluded disadvantaged minority people. Because the tall, long legged young men’s club keeps picking low quality players, clubs must be forced by quota regulations to pick minorities. Just as women quota have improved the bottom line of European Companies. One can find excellent soccer players in all these groups. It has been scientifically proven that diverse teams, that don’t select players from a privileged minority but rather from the entire vast diversity of the world’s population have only to gain. 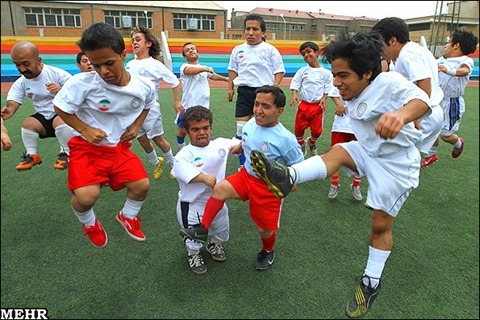 Ideally, for maximum diversity and maximum improvement of the world cup soccer game, a coach should pick an obese 70 year old 120 cm (4′) short legged transgender woman dwarf amputee. If this talented person does not get hired, civil rights lawyers can help her to sue for lost income, based on the million Euro salaries soccer professionals earn. Punish more Asian and White Students – demands Eric Holder to get equal discipline rate for Blacks, Asians, and Whites. The 200 is as much a sprint as the 100. Percy Walker a white Canadian was another Olympic 100 meter winner and I guess any number of white Americans whose names I do not know. Given that only about 10-20% of the world’s population is white I would suggest that just to take the 20th century white people have punched above their weight in the sprints – or am I to suppose that black people were being oppressed by whites. I am perfectly at ease with the idea of black superiority in the Sprints but I just do not think the facts necessarily support the proposition. I suspect given the winners I mentioned that there is now a lack of interest. @Opus, I checked, Greek Costas Kenteris really won the 2000 Olympics 200 meter race. Seems Black superiority is mainly in 100 meters? Thanks for that hint. No no no!! You’ve got it all wrong. With doctors, lawyers and executives, it doesn’t really matter whether or not we have the best person for the job. But when it comes to sports, it’s very important that only the best candidates get recruited. Blacks are faster and better at running in general in seems. Look at American Football, the only two positions that whites excel in more than blacks are the positions that don’t require fast running: Quarterback and of course Kicker (I think there have only been a few black kickers in the history of the NFL.) But even the black quarterbacks are always better at running the football than the white quarterbacks. Nevertheless, as four of the starting eleven were white that means that 36% of the players were black yet not even the most creative of equality theorists thinks that 36% of the English population is black; therefore no matter how good the black players may be, we need affirmative action for white players. FWIW I am rather suspicious about the idea that blacks are better sprinters – they may be, or it may just be that white men prefer to engage in somewhat more physically and mentally challenging pursuits such as Tennis. If white people abandon running then by default black runners will look fast. During the 20th century, white runners did rather well as sprinters: Liddell, Abraham, Borzov (surely the most graceful sprinter ever) Hary (fastest start ever), Wells, Mennea, and as recently as the 2000 Olympics Kenteris, come to mind as white sprint victors at the Olympics. I understand that something similar has happened with boxing. It is of course politically quite acceptable to assert black superiority when it comes to running, but not when it comes to certain other things. The trouble with playing any number of black players in your team is that as soon as you play less than previously there will be a cry of racial discrimination. @opus, actually Blacks are quite successful in sports. Actually, there is a huge diversity of different tribes in Africa, some are good sprinters, others excel in Marathon runs. Read the articles above about Olympic 100 meter dashes. Blacks seem to be clearly superior in 100 m sprints. Which is no problem for me, as I am in favor of FACTS and TRUTH, not for white supremacy. But, it is a problem for the equality dogmatists, because even SUPERIORITY for Blacks in certain issues is damaging to their equality theory. By the way, I noticed that people who are not deeply informed about affirmative action, women’s “rights” etc do not understand the joke of the article. I will have to add a paragraph explaining the issues to the uninitiated. I thought teams were already selected on the basis of Diversity. Imagine, had Roy Hodgson failed to pick even one black player for the disaster against Italy and what the papers would have said; noticeably the rot stopped when two were substituted by non-black players, albeit too late, yet that must surely only be coincidence. Sadly, I had walked out long before as I was less than impressed by the randomness of Sturridge’s off-target shots. @opus, but you are right. Had they not put up any diverse Black players, of course, they could have blamed the coach’s racism for the bad performance. And notice, racism is actually a crime in many countries.